I’ve always had it drummed into me that it’s important to get children’s feet measured regularly and always make sure they have well fitting, well made shoes. Decent shoes are the one thing that I will always pay money for and would never buy cheap shoes for my children to wear regularly but with this in mind I found it hard to find places to buy quality shoes for LP without resorting to the usual shop on the High Street. Bobux recently gave LP the opportunity to review a pair of their shoes and it coincided nicely with us having just got her feet measured. Given the awful British weather at the moment and it still being raining and cold more than sunny we opted for a pair of boots for her rather than shoes. Who are Bobux Children’s Shoes? Bobux are originally from New Zealand but they now sell their innovative range of baby and toddler shoes all over the world. Every pair of shoes maintains the healthy feet ethos that was established over 20 years ago. I originally thought they were purely an online retailer but I’ve since found out that their shoes are actually stocked in many independent shoe shops across the country – One being in my local town and another three stores within a short driving distance. What were our first impressions of Bobux Children’s Shoes? LP’s new Urban Beat Boots arrived and she couldn’t wait to try them on – “New shoes Mummy!”. I managed to keep LP away from the boots just long enough to take a picture and then she insisted on wearing them around the house – she was such an excited little girl! I was pleased that the boots had not only a velcro fastening but also a zip meaning that they were easy to get onto LP’s feet and also stayed securely in place. The soles of the boots are made of flexible rubber allowing LP’s feet to grow whilst wearing them and Bobux offer a lot of information online to make sure that any shoes you buy are the correct size – I also love that if the shoes don’t fit correctly or you change your mind all returns are free of charge. Bobux have a great range of shoes – Soft newborn shoes, soft sole shoes for developing feet, pre walkers and shoes for confident walkers. When looking for somewhere new to buy shoes for LP I’m pleased to have found Bobux. Their shoes are different with a vast array of colours and styles – It makes a great improvement on the just pink and purple shoe choices we’ve had for LP over the last year – Being able to choose ‘girls’ shoes that are green, brown or blue is such a novelty and something I could definitely get used to! 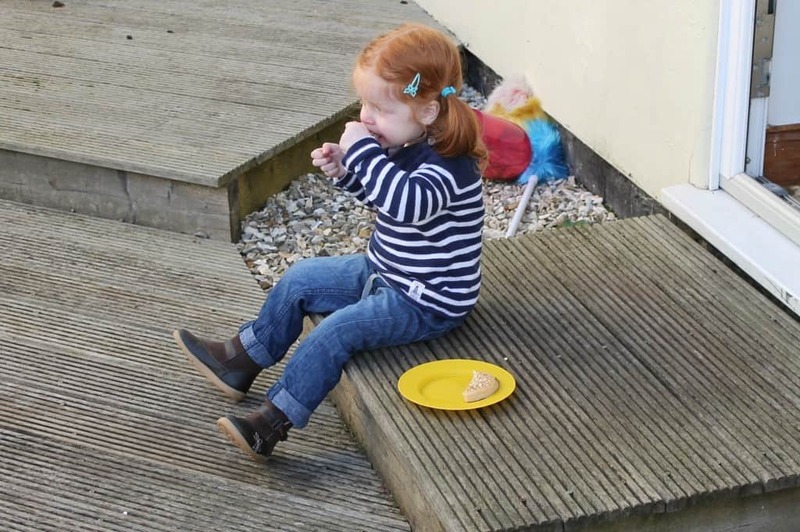 LP has loved wearing her Bobux boots and we’ve loved having them – They are well made, fit her comfortably and a nice pair of boots are a staple for any wardrobe – Even if you are only two and a half! LP’s feet seem to be growing incredibly quickly for someone so petite and I will definitely be shoe shopping with Bobus in the future. They are the best shoes for preschoolers that we’ve come across. Disclosure: We were sent the above boots for the purpose of the review however all opinions are my own.